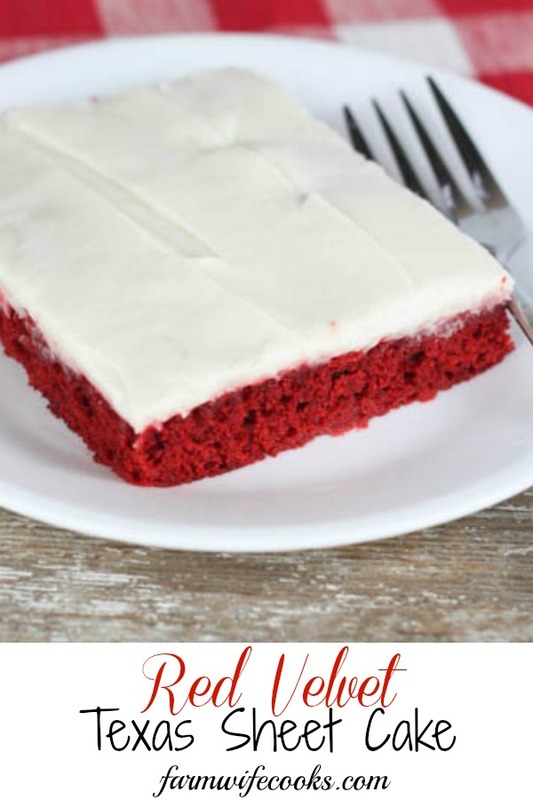 Red Velvet Texas Sheet Cake with cream cheese frosting has your favorite red velvet flavor, can be made in a hurry and will feed a crowd! It is no secret I love Texas sheet cakes. Don’t get me wrong I love all cakes and love to decorate “fancy” cakes but they can just take more time than I have some days and those days are the ones I make a sheet cake, same yummy flavors but way less time involved. 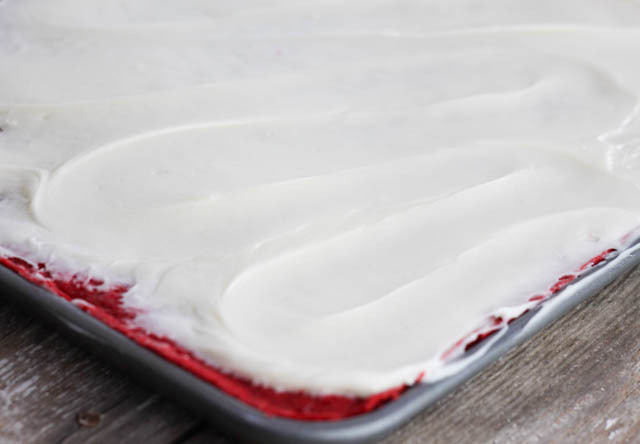 You may be wondering what the difference is between a regular sheet cake and a “Texas” one. Well with a Texas sheet you normally boil some of your ingredients which gives the sheet cake a unique more fudge like texture. 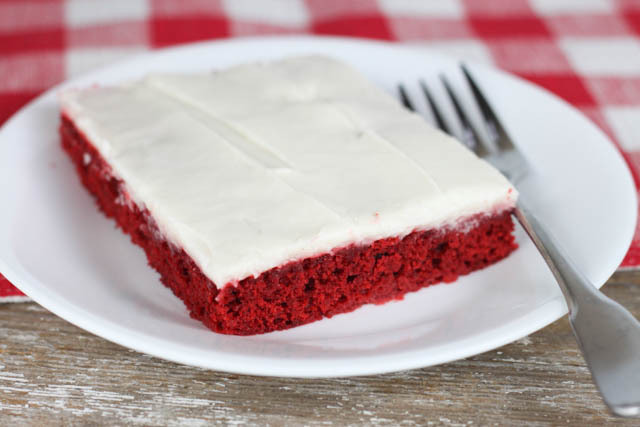 The cake is also thinner and is made in an 11×17 inch sheet pan. 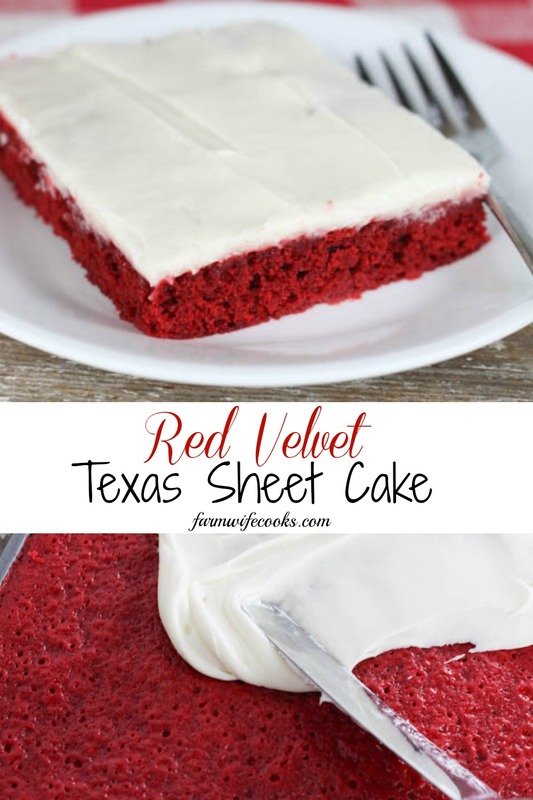 Here are a couple links to more Texas Sheet Cake flavors, Texas Sheet Cake (traditional chocolate), Vanilla Texas Sheet Cake. 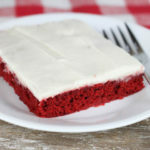 Red Velvet Texas Sheet Cake is the perfect cake recipe to make for a holiday (would be perfect for Christmas, Valentine’s Day or 4th of July!) 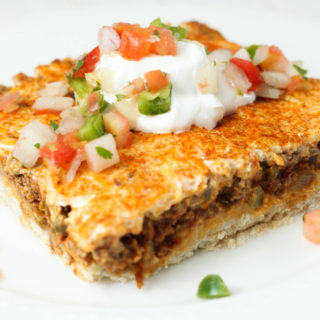 and is the perfect size to make for company or to take to a get together. This cake will cook a lot quicker than a traditional cake because of how thin it is so be sure to set a timer! I always let my cake cool for about 5 minutes before spreading the frosting on. There is just enough icing for a thin layer (just how I like it!) so if you are an icing fan I would double the recipe. In a medium saucepan over medium heat bring the water, butter (1 stick), shortening, buttermilk and cocoa to a light boil and then pour over the flour mixture and stir until blended. 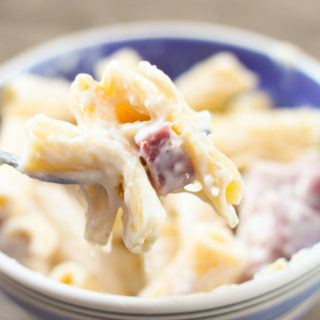 Gradually add the eggs, vanilla, food coloring and soda; mix well. Pour into a lightly greased 11x17 inch pan. Bake at 350 degrees for 20-25 minutes or until a toothpick inserted in the middle comes out clean. 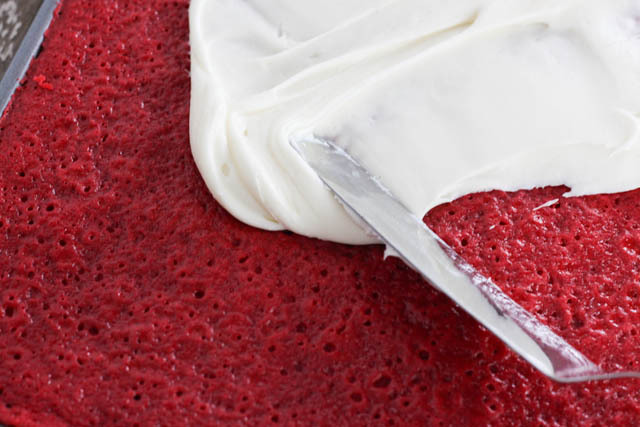 To make the icing blend together butter (1 stick), cream cheese and vanilla. 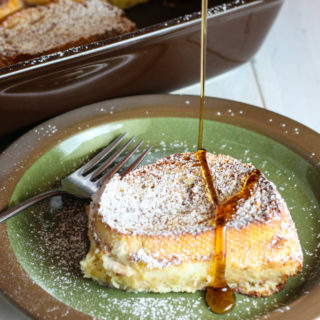 Add the powdered sugar gradually and blend until light and fluffy.